Using the Function Editor view, you can fine-tune the animation of a layer or camera movement in very specific ways. In the Stage or Camera view, select a layer that contains animation. This is indicated by the yellow Animate icon. Layer Transform button for layer animation. Camera button for camera animation. NOTE: To switch between layer and camera functions, click the Show Camera Functions button at the bottom of the Function Editor view. When the button is selected, camera functions are displayed in the graph, When deselected, layer functions are displayed. In the Tool Properties view, click the Function Editor view button. The Function Editor view is blank until you select the layer containing the functions you want to display. In the list of functions, check the functions that you wish to edit, and uncheck the ones you want to leave unchanged so that they do not clutter the graph view to the right. You can change the colour of the function's representation in the graphic by double-clicking on the coloured square to the right of the function's name. This can help you identify the functions visually. In the function editor view, identify which functions are the Velocity (Velo) functions. If necessary, uncheck all other functions in the functions list so that only the velocity function you want to edit to appear. Click on the Reset View button to adjust the graph view to the size of the functions that are currently visible. Click on the Reset View Vertically button if you only want the functions to fit within the view vertically. While holding Spacebar, click and drag on the graph to pan it. Press 1 to zoom in on the graph or 1 to zoom out of the graph. Select one of the keyframes of one of the velocity function. In the top of the function view, right of the Frame and Value fields, expand the extra parameters section. If the arrow is pointing towards the right , click on it so that it points to the bottom. The Left Angle , Left Ease Out , Right Angle and Right Ease In fields display at the right of the Frame and Value fields. NOTE: Since extra parameters depend on the type of keyframe selected, if keyframes from several different types of functions are selected at the same time, no extra parameters will be visible. To remedy this, discard the selection by clicking anywhere inside the function graph, then click on the keyframe you wish to select. In the Left Ease Out field, type in the amount of frames the ease-out before this keyframe should last. In the Right Ease In field, type in the amount of frames the ease-in after this keyframe should last. Click on one of the points left and right of the selected keyframe and drag it along the circle to adjust the angle of the ease on that side of the keyframe. Type in the desired angles in the Left Angle and Right Angle fields. 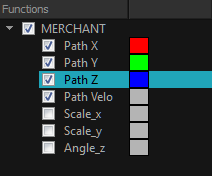 In the function editor view, identify which functions are the coordinate (Path X, Path Y and Path Z) functions. If necessary, uncheck all other functions in the functions list so that only they are visible. Select one of the keyframes of one of the coordinate functions. To adjust the value of the coordinate, click on the keyframe and drag it up or down, or type in a new value in the Value field at the top. To adjust the position of the keyframe in time, press and hold Alt, then click on the keyframe and drag it left or right. 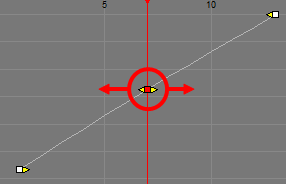 This will adjust the position of the keyframe in time for all corresponding coordinate functions (X, Y, Z and Velo). The Tension , Continuity and Bias fields display at the right of the Frame and Value fields. In the Tension field, enter a value between -1 and 1. A positive tension will reduce the curve of the path between keyframes. A negative tension will increase it. 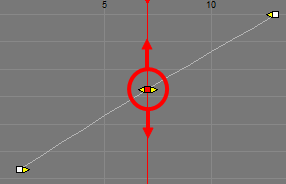 In the Continuity field, enter a value between -1 and 1. A positive continuity will cause the path to curve beyond the trajectory between each keyframes. A negative continuity will have a reverse effect. In the Bias field, enter a value between -1 and 1. 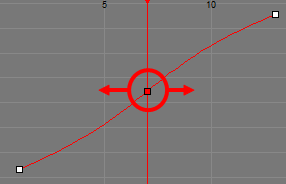 A high bias will make the curve more straight before the keyframe and more curved out after it. A negative bias will make the curve more curved out before the keyframe and more straight after it. NOTE: Tension, Continuity and Bias settings are applied for all the functions in the same path (Path X, Path Y and Path Z) simultaneously. Locate the yellow arrows pointing towards the left and towards the right of the keyframe. By default, those arrows will be at the same position as the keyframe. 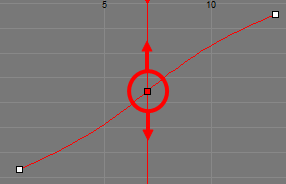 You can click and drag on the left Bezier handle to adjust the curve at the left of the function, or on the right Bezier handle to adjust the curve at the right of the function. In the top of the function view, right of the Frame and Value fields, expand the extra parameters section. If the arrow is pointing towards the right , click on it so that it points to the bottom. The Left Length , Left Angle , Right Length and Right Angle fields will appear at the right of the Frame and Value fields. You can use these fields to adjust the angle and length of their respective Bezier handles relative to the keyframes.